Ivoryton Playhouse is not known for new plays on difficult subjects, tending to specialize in spirited revivals of classic or soon-to-be-classic musicals. The decision to close the 2018 season with a hard-hitting topical play should make theater-goers glad to be surprised, though the play may not be considered a pleasant surprise. In The Queens of the Golden Mask, playwright Carole Lockwood creates a play that, in the words of its director at Ivoryton, Jacqueline Hubbard, is like “a cross between Steel Magnolias and Mississippi Burning,” a description that is accurate enough. As such, the play is something of a remedy to the cutesy version of the South as full of charming and idiosyncratic “characters.” Here, there’s even a touch of The Stepford Wives—a creeping unease about the costs to one’s moral values and autonomy in belonging to the neighborly town of Celestial, Alabama. The Queens revisits a world that, once seemingly relegated to history, is on the upswing again. The Ku Klux Klan—as a voice for white supremacy—is a reference point for much of the racist hatred and violence in our current political climate, and the KKK was enjoying a virulent resurgence during the era of the Civil Rights movement in the South when the play is set. In Lockwood’s play, we first hear the Klan spoken of—as a part of the social culture of Celestial—the way that belonging to any “ladies’ auxiliary” might be, or, say, joining a Yankee organization up north such as the DAR. The cluelessness necessary to sustain denial about the potential for cold-blooded acts of persecution or murder is maintained for a good portion of the play by Rose Jackson (Anna Fagan), a newlywed, newly arrived from Ohio, where she met and married an Alabama boy. Now, in his hometown, she’s trying her best to fit in. The other ladies make that seem easy, pressuring her into a “blood oath” as if as chummy as sharing recipes. And that’s an apt comparison because the sect seems to be nothing more than a “taste” shared by the seven members of the local chapter. A lot of the dialogue is just so we get to know the seven members: Ida Sage, aka Moma (Ellen Barry), the ringleader; Ophelia Barnett, aka Fifi (Bonnie Black), the ditzy one; Faith Carlyle (Gerrianne Genga), the fashionable one; Jean Mooney (Jes Bedwineck), the sassy one; Kathy (Two) Boggs (Bethany Fitzgerald), the oft-pregnant girlish one; Rose Jackson, the newcomer; and Martha Nell Sage (Sarah Jo Provost), the subservient daughter-in-law to Ida. The interplay among the women may be too much Steel Magnolias in the sense that we’re already a bit too familiar with the types, but also in the sense that we immediately assume there must be a death or two to bring gravitas to the circle. The hints that the menfolk are up to some clandestine activity that isn’t harmless are too overt not to be noticed, so we know the play’s dramatic crisis will involve a revelation of the Klan’s misdeeds. Mention of the Klan is like the gun in that famed saying by Chekhov—once you introduce it, it will have to go off. The story references the actual bombing of a church in Birmingham, an appalling act that certainly overwhelms whatever fellow feeling we might have for these ladies. The shift from southern charm to baleful malevolence occurs best in Ellen Barry’s fully nuanced performance. Early on, we detect that Ida is tough as nails, but by the end we might easily see her as a monster, empowered like a minor crime boss to exact vengeance with a steely smugness. It’s a chilling role and, impressively, Barry does it full justice, letting us see how self-righteous the pitiless can be. The plot requires a certain number of events that might strain our credulity, as for instance, the number of traitors in the ladies’ midst. Martha Nell Sage is played by Sarah Jo Provost with a sense of dutiful suffering that transforms into active malice, but her downfall comes via a fairly flimsy device, in more ways than one. As Kathy (Two) Boggs, Bethany Fitzgerald has two over-the-top scenes, one in which she begs Rose to join the Klan, another when she mourns the death of a friend who died standing up to police. The switch from devoted member to disillusioned member comes across as excessive in its staging. As Fifi, Bonnie Black takes on most of what we’d consider comic relief, furnishing the kind of dimwit that, it seems, many take racists and bigots to be. That she should be the one most trustworthy is a judgment on the determined need to be needed and trusted that seems to underwrite many an urge to conformity. Her verbal sparring partner is Jean, and Jes Bedwinek plays her as the one most likely to be “woke,” if only because she’s able to see through the plastered-on niceness the ladies exude. In a sense, Faith, played with a self-aggrandizing sense of purpose by Gerrianne Genga, is the most dangerous, the type best able to make bigotry fashionable and reasonable. 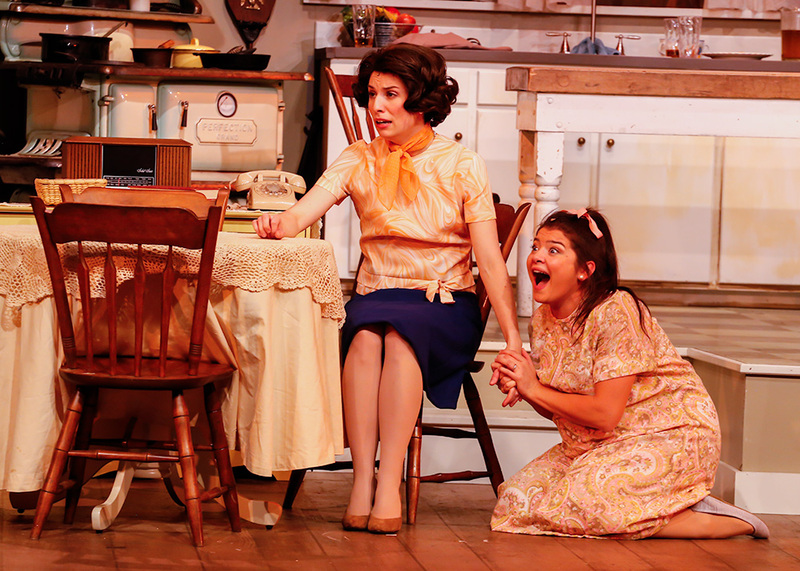 All told, the play is one with its heart in the right place, played across a sprawling set where a middle-class kitchen is flanked by a shed and a somewhat rundown porch. There’s a contrast between a lower-class identity and an upward mobility that feels right for a demographic en route to dumping the Democrats for the Republicans. The play leaves us with hope, perhaps, for some of the individuals in the drama, and acts as a stimulus against the kind of bullying defended by evasive logic and repressed facts we are all-too-familiar with today. The best aspect of the play, as drama, is its staging of how insular accepted views can be, and how fatal.